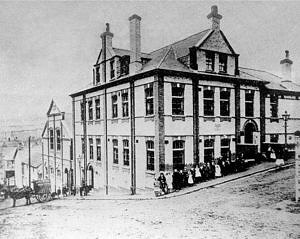 The First Reading Rooms at Abertillery in 1856. Long before Mr Thomas Wilde Powell came to the valley, education was at the forefront of the long term planning for the towns workforce by the industrialists. Sir Thomas Phillips was born near Brynmawr, he became the Mayor of Newport and was caught up in the battle at the Westgate Hotel, Newport during the Chartists uprising in 1839. He later came to Abertillery, fought for the Welsh language and worked with Messrs T. P. & D. Price (Penybont Colliery owners) along with Mr John Conway (Abertillery Tin Works proprietor) on setting up the first reading rooms at Abertillery in 1856. They later had support from Mr James Brown (the Blaina and Cwmcelyn Iron Works owner and brother of Mr Thomas Brown – Cwmtillery Colliery founder). They rented a room from Mr Hiley close to where the arcade is today and filled it with books, papers of the day and other periodicals. They only leased the room for a short period whilst they awaited on a permanent room at the newly planned National Schools connected to St Michaels Church in High Street, Abertillery (where the Bus Stops are today). The Powell’s Tillery years and the Workmen’s Hall and Reading Room. When Mr Thomas Wilde Powell took over the Penybont Tillery Colliery from Basil Jayne & Co in 1882 his first commitment was to give as a gift to the workmen a hall with a library and reading room, he had it built at his own expense. 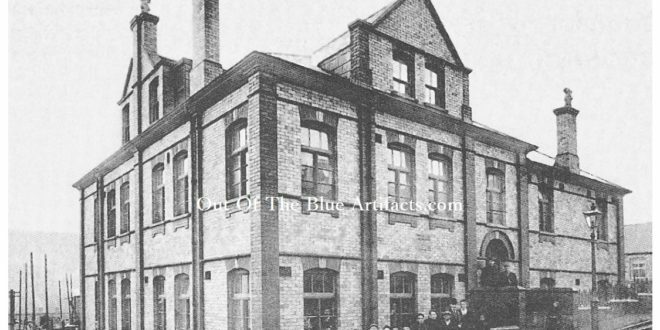 The Tillery Street Workmen’s Hall and Reading Rooms. 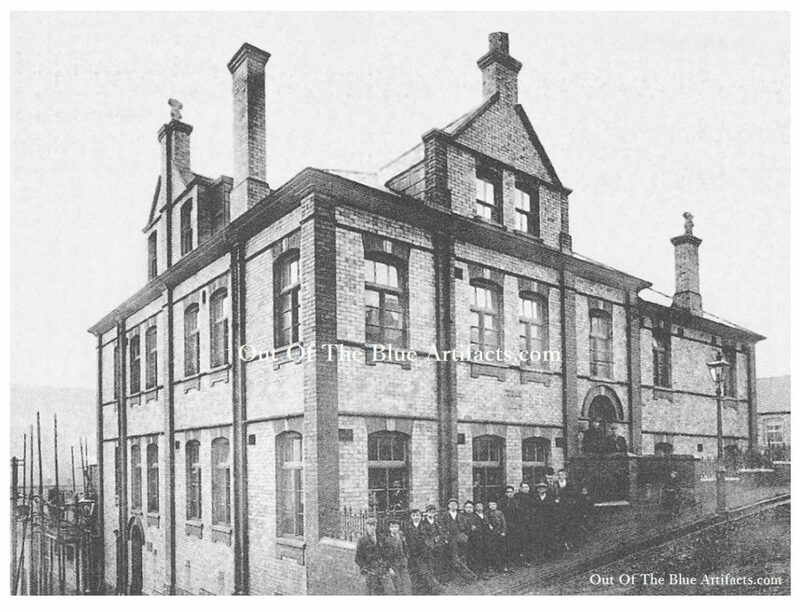 On 12th January 1884,the Tillery Street Workmen’s Hall and Reading Rooms were officially opened. The hall was on Tillery St, Abertillery, it cost between £700-£800 to erect and was capable of holding 300 people. The hall was in use throughout the 1880’s and 1890’s though as the community grew and more workmen came to the area this hall became too small for its purpose and a much larger one was required. In 1896 Mr Powell arranged to have a large institute built, one which would also house a gymnasium and swimming pool. The Powells Tillery New Institute, Division Street, Powell Street. On the Monday 4th April 1898, the Powell’s Tillery Institute was officially opened by Mr Thomas Edmund Powell (Thomas Wilde’s son and the new Chairman) of Powell’s Tillery Collery Company and his sister Lady Christiana Herringham nee Powell. Lady Herringham was presented with a gold key for the ceremony. Many of the dignitaries of Abertillery were at the opening of the new institute and afterwards a luncheon was held at the National Schools, Abertillery, which were highly decorated for the function. The building was made of the Powell’s Tillery Company’s buff faced bricks, pilasters, moulded cornices and other dressings in Llantarnum red faced bricks. In the basement there was a heating chamber, the ground floor two billiard tables and raised seating for spectators a public reading room and library with toilets. On a mezzanine floor there were two slipper baths for the ladies on the entrance to Division St. On the 1st floor were three committee rooms which could have been converted into one big room for large gatherings capable of holding over 200 people, a smoke room lavatories and slipper baths for the gentlemen. The top floor was for the caretakers use only. The conditions of membership was as follows – Outside members subscriptions was sixpence per month. Baths non members 4d. outside members 3d. Billiards game of (50) 2d. game of (100) 4d. Plans for the gymnasium had been forwarded but not yet been decided on when the work will proceed. The Contractor was Mr J. Davies from Newport. The Architect was Mr F. R. Bates of Newport. The new Powell’s Tillery Institute Gymnasium (as seen attached to the institute) was opened at the Abertillery Institute in March 1902 by Dr H. A. Powell the son of Mr T. W. Powell, and new chairman of the Powell’s Tillery Co (sadly his brother Mr T. E. Powell passed away before the gymnasium was built) he was presented with a gold key by the architect Mr F. R. Bates and he opened the new building, the cost of the build was £2,500. The gymnasium was 80′ foot by 38′ feet, and at a height of 32′ feet, with an entrance lobby and a ticket office with a fireproof staircase and changing rooms for the ladies and gentlemen. The instructor at the gymnasium was Mr William Dunlop Essex. Mr Essex was from the Scots Guards. Later the gymnastics team was formed at the institute gymnasium and went on to become one of the best competitive teams in the country, they achieved so much in their short history. The following is a link to their story – Powell’s Tillery Gymnastics Team – Story. In June 1908 the Powell’s Tillery Company decided to add a new wing to the institute. The institute had become such a success it was deemed necessary to expand the building and the new wing costing £1,600 housed a larger billiard room and reading library. The new billiard room was 50′ feet by 40′ feet with space for six tables and a raised platform for viewing spectators. Above this billiard room was the reading room, the same size as below, with pitch-pine newspaper stands and magazine tables etc. The room also had an open ceiling giving plenty of ventilation. Provision had been made in the original building for a lending library which was fitted with book cases capable of holding 2,000 volumes. The opening ceremony was presided over by Mr James Price (Chairman of the Committee) also attended by Mr William Stewart (Managing Director of Powell’s Tillery) and Mr F. R. Bates (Architect of Newport). Mr Turner (Building Secretary). After the formality of the speeches, Mr Price was presented a gold key suitably inscribed for the occasion by the Architect with which he officially opened the new wing. The contractor of the new wing was Mr Smith of Kidderminster. Mr Phillips was the clerk of the works. The construction was carried out under the plans of Mr F. R. Bates who acted as architect. On Saturday 1st May 1909, for the first time in history the International Gymnastics Tournament was held at Powell’s Tillery Gymnasium, Abertillery. The contests was between England, Scotland and Wales. Mr C. V. Sederman (Wales) cleared the highest jump of the contest by clearing 5′ feet 2″ inches. The highest rope climb was by Mr W. Fergus (Scotland) at 18 yards. England won the competition easily with a score of 282 points, Scotland second with 253 and one sixth points, Wales third with 214 points. On Monday 3rd September 1910 the Powell’s Tillery Swimming Pool was officially opened. The opening ceremony was conducted by Dr H. A. Powell managing director of Powell’s Tillery Co, also present were Mr W. Stewart J.P. the managing director, Mr W. Brace M.P. Mrs Stewart, Miss Stewart, among others. Mr W. Beddoe Rees of Cardiff prepared the necessary plans and Mr A. J. Colborne of Swindon was the contractor, Messrs Bradford and Co did the engineering work. It had a gallery on 3 sides, the pool was 60 feet by 22 feet, hot and cold shower baths, a diving stage, spring board and other up-to-date appliances. Description of the Swimming Pool. The water was heated by steam from two upright boilers, the building was also centrally heated by the same means, there was also a steam laundry in the basement. Because of the scarcity of water in the area at this time there was a filtration plant installed by the Turn Over Filter Company of Belfast. The walls and floor of the bath were lined with white glazes bricks inlaid with green and white mosaic tiles. A special feature was the addition of collapsible dressing boxes. During the winter months the pool would be covered by a movable boarded floor and a platform will be erected for the use of concerts etc. After the opening ceremony and speeches, the committee had a special tea put on for them at the Ebenezer, Abertillery. The contractor of the swimming pool was Mr A. J. Colborne of Swindon. The architect was Mr W. Beddoe Rees of Cardiff. Messrs Bradford and Co did the engineering work. On Monday 16th April 1951 the Powell’s Tillery Institute sadly caught fire and burned down. It was reported that the fire started at approximately 2.00am in the gymnasium and spread up over the back roof into the main building. Eight fire-fighting units were called to the scene after the fire was extinguished it was found that apart from the extensive irreparable damage to the building over 1,000 books were destroyed. It was also reported that bound volumes of Hansards dating back to 1850 and over 200 reference volumes were also destroyed in the fire. 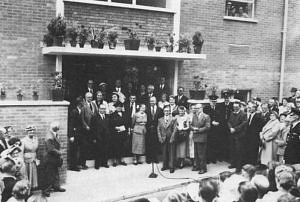 On the 27th August 1955 the opening ceremony of the new re-built Powell’s Tillery Institute (as seen in the image right) took place. Later a specially commissioned mosaic was placed above the main entrance onto Powell Street showing mining scenes with a centre piece of a phoenix rising from the ashes. The latter was portraying the new institute rising from the flames of the old. The institute was later used by the miners of the Cwmtillery, Roseheyworth and Six Bells Collieries and as the headquarters for the latter two collieries during the Miners Strike of 1985-85. It was in constant use at that time as a soup kitchen and food distribution centre for the miners families. In about 2016 all activity in the institute ceased and the building was put up for sale. In 1882 Mr Thomas Wilde Powell took over the Tillery Colliery, Penybont and it was then known as Powell’s Tillery. Mr Thomas Wilde Powell, was a solicitor, philanthropist, banker, broker and art collector etc, he lived in Piccards Rough, Guildford. His wife was Mary Elizabeth nee Marten. In 1884, shortly after coming to Abertillery, Mr Powell paid for the erection the Tillery Reading Rooms, Abertillery. Mr Powell was also instrumental in the construction the Powell’s Tillery Institute at Division Street Abertillery, built in April 1898, though he sadly died in January 1897 just before its completion. Mr T. W. Powell had an estate in Western Australia, and left a personal estate that was valued at £195,508. 5s. 9d. the equivalent to £11,407,763,03 in today’s money. At the time of his death Mr Powell was in the company of Heseltine, Powell & Co. Stockbrokers. Mr Charles Marten Powell, son, a surgeon. Mr Thomas Edmund Powell, son, a stockbroker. Mr T. E. Powell later became the director of Powell’s Tillery Company from the time of his father death in 1897. Mr Powell opened the Powell’s Tillery Institute along with his sister Christiana Herringham in 1898. Mr Thomas Edmund Powell died in 1901. Mr Herbert A. Powell, son, a doctor. Mr Herbert A. Powell took over the directorship of the company after the death of his brother Mr T. E. Powell 1901. Mr H. A. Powell opened the Tillery Institute Gymnasium, Abertillery in 1902, he was presented with a gold key by the architect with which to open the gymnasium. Lady Christiana Herringham, nee Powell, daughter, (1852-1929). In 1880 Christiana Powell married Physician Sir Wilmot Parker Herringham K.C.M.G. C.B. (1855-1936). Lady Christiana Herringham was a prominent painter. In 1898 Christiana opened the Powell’s Tillery Institute, Abertillery, along with her brother Mr Thomas Edmund Powell, she was presented with a golden key by the architect with which to open the institute. Mrs Mary Elizabeth Turner nee Powell, daughter. Mary Elizabeth was married to Mr Hugh Thackeray Turner (Architect, China Painter) – Their daughter Ruth Turner married Mr George Leigh-Mallory (Mountain Climber).